Female frogs have two ovaries and a pair of oviducts in their reproductive system, located beside the kidneys. The female frog creates 2,000 to 20,000 eggs that she retains inside her body from late summer until spring, preparing for breeding season. From late summer until the spring, the eggs mature inside the frog's body until mating season begins. If the mature eggs stay inside the ovaries beyond a normal breeding season, the eggs begin to deteriorate, or cytolize, inside the female frog's body. Female frogs lay up to 4,000 eggs at a time, which are immediately fertilized by the male. 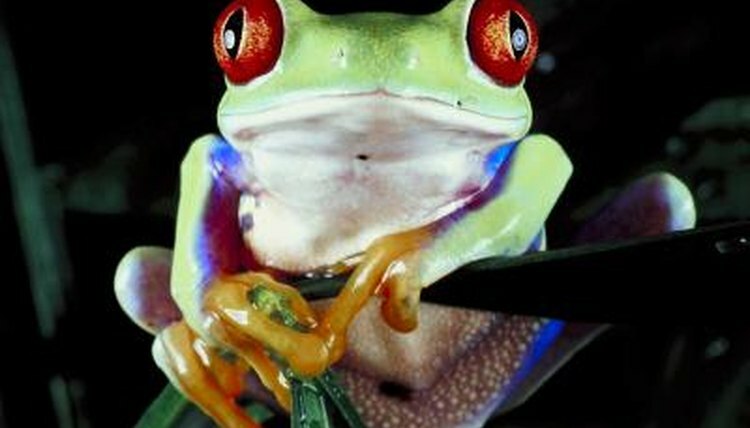 Frogs become sexually mature around four years of age. They emerge from hibernation from February to March to seek out breeding grounds. Females lay their eggs in shallow water. It takes about 40 days for tadpoles to emerge from the eggs. When the female's eggs mature, the male frog positions itself on her back, wrapping his forelimbs around her middle in amplexus, or pseudocopulation, which can last several days. Under pressure from amplexus, the female releases mature eggs through the cloaca located near the hind legs. The male frog immediately releases seminal fluid from the male cloaca, pouring it over the eggs as they are released from the female. The eggs are immediately fertilized before dropping into the water. A jellylike substance surrounds the egg when dropped into the water, and it swells on contact to protect the eggs from predators, harmful debris and bacteria. Within 10 days of fertilization, the embryo develops into a tadpole and emerges from the egg with strong wiggly movements. Young tadpoles feed on microscopic plants beneath the surface of the water. After two months the tadpole develops lungs and pokes his head above the water surface, using newly developed lungs to gulp air. The tadpole's hind legs and tail are fully developed at this stage. The transformation stages can be altered, lasting longer than expected if water temperatures are cool. Warm water is the best environment for frog development. Development of the front legs appears around three months, in addition to the tail being slowly absorbed into the body. Skin is shed and a wide mouth develops. The frog emerges from the water source where it began his life, now fully developed into a frog. Frogs live on damp grounds or shallow still water, easily alternating between the two environments.